Available in either battery operated LED strobe light or mains powered 20w mini strobe models these strobe lights add fantastic flashing lighting effects to your party. The 20w mini strobe combines a high intensity strobe bulb and a variable flash rate so that you have superior flashing effects in a more compact model. Complete with a mounting bracket, this mini strobe is ideal for parties and discos. 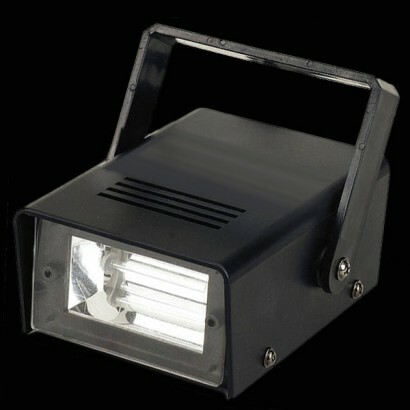 For fabulous portable strobe lighting why not choose the Battery Operated Strobe. This uses incredibly bright white LED lights to create a stunning strobing flashing effect. LED's are ideal for battery operated strobes as they use a marginal amount of electricity compared to regular bulbs, and the bulbs don't blow. Battery operated using four standard AA batteries, there's no wires or need for bulky adaptors, which means that you can take your party anywhere!